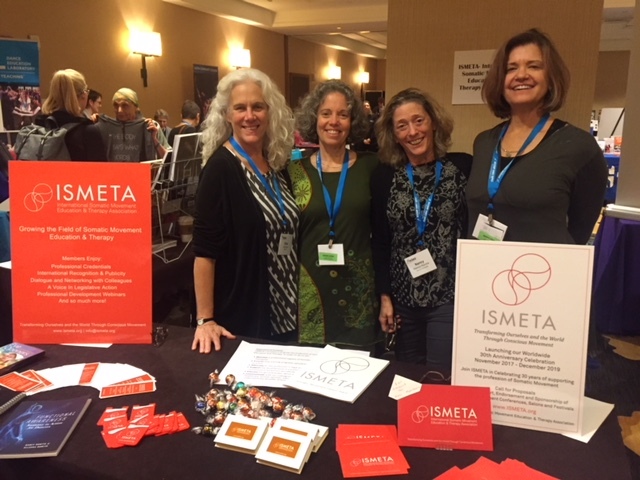 ISMETA current and past board members travelled to San Antonio, Texas to present a panel on ” The Role of Somatic based Dance Practices – Gateway to Inclusive Access for All Movers” at the annual National Dance Educators Organization Conference . The panel was moderated by Elisa Cotroneo (ISMETA Executive Director) and included Martha Eddy (former ISMETA Board President), Anna Rider (ISMETA board member), Beth Riley (current ISMETA Board President), and Nancy Romita ( former ISMETA board member). The room was packed with dance educators interested in Somatic Movement. The weaving of knowledge that came from the panel inspired a rich conversation and they wove their ideas and experiences together beautifully ( or so the report was). The ISMETA table allowed us to meet so many educators and students from universities and K-12 schools throughout the U.S. looking to expand their knowledge of Somatic Movement and specific Somatic Methods. We met people who have known about ISMETA and have always been curious to know more, as well as people new to ISMETA and to Somatic Movement as a professional field. We were satisfied and excited to advise students to consider exploring a career in Somatic Movement and to augment their dance experience and allow ISMETA to give them support in including Somatic Movement in teaching dance classes as new graduates. Many Higher Ed programs were interested in including somatic studies in their offerings and we expect many new University Members. There is quite a buzz about ISMETA here! So much appreciation has been shared for our work to support the profession and foster the growth of Somatic Movement worldwide ! One of the most beneficial aspects of the trip was having LIVE TIME together to collaborate and talk about our work as Board members and volunteers who are honored to be able to work together in the service of the field.